Many of us probably fancy ourselves to be excellent gift givers, but that doesn’t mean we don’t still get it wrong from time to time. Encouraging loved ones to hop onto a wish list site can be a brilliant fix. They’ll be able to ask for exactly what they want and you won’t waste time or money picking out yet another off-the-mark gift. 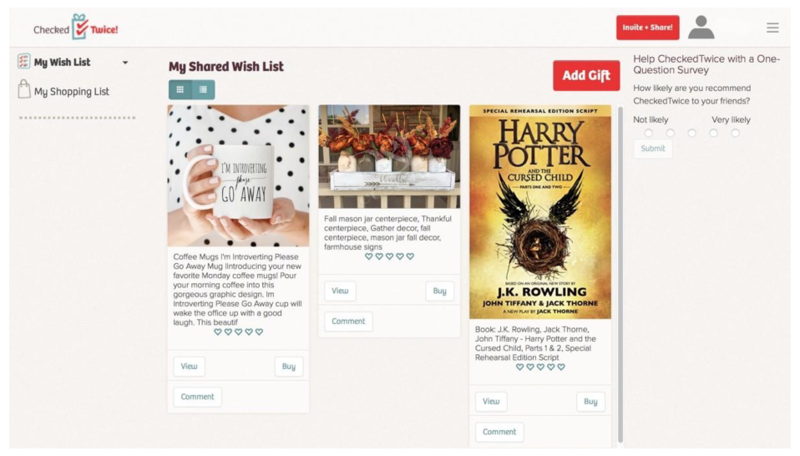 On the other side, creating your own wish list and sharing it gives your loved ones options. They can see the things you’d really like and be sure they’ll choose something you’ll love. The element of surprise and thoughtful nature of gift-giving remains intact and rings more festively than a pile of gift cards. To help make holiday gifting and receiving more satisfying, we’ve compiled the top four online wish list sites. While The Big Guys and their lists are well known, they also tend to be exclusive, closed shopping systems. In these times, though, consumers are much savvier, often stretching outside the confines of just one platform to fill their baskets. With that in mind, we chose to explore some of the more unique and versatile applications in the market today. These offerings come from companies that are changing the Wish List game, making it easy to add any gift from anywhere across the wonderfully wide web. 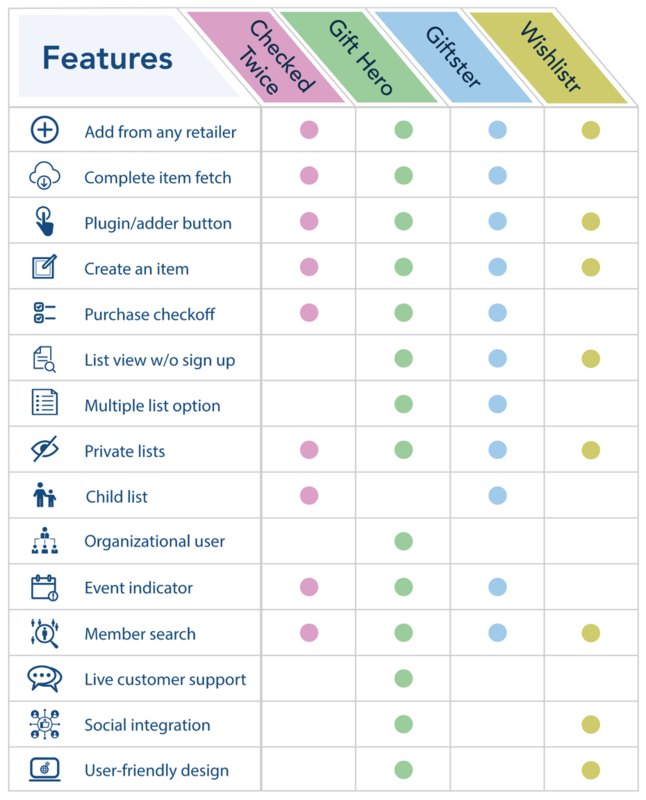 With our 15-point checklist, we tackled the task of signing up and testing each site on a variety of criteria. 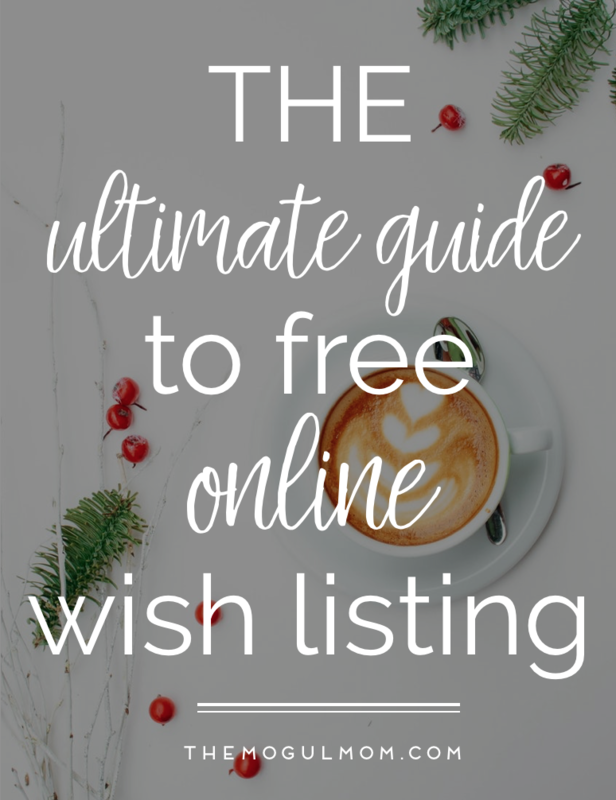 No matter which features you are looking for, there is sure to be something that will fit everyone’s needs in this ultimate guide of online wish list sites. Don’t worry, you’ll still be able to stick to your healthy tech diet. Gift Hero positions their offering as “The Best Wish List Ever.” They’re the newest player in the universal Wish List game, but there seems to be good reason for that pitch. There are a variety of ways to add items and no limit to the number of wish lists you can manage. The site ranks number one for both aesthetics and ease use, with a strong user-friendly design. The functionality of their browser plugin button is fantastic and the live customer support feature can ease you out of any wish list tight spot. The holiday-neutral feel of this site leaves ample room for year-round and any occasion (think wedding or baby registry) wish listing. Gift Hero lacks the option to create a wish list for a child. This would be a nice enhancement, but the limitation can be worked around by adding a separate wish list to an account. 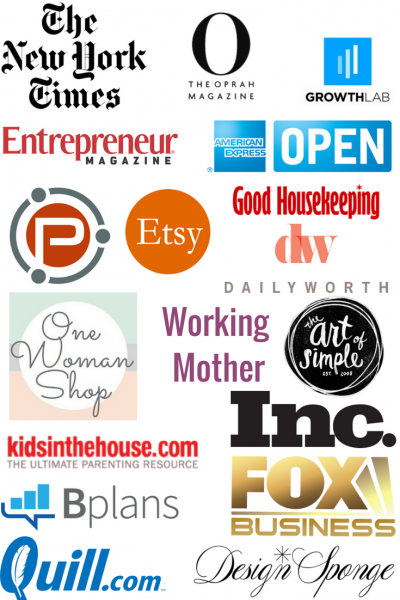 This feature-rich site scores well across the board, with a strong user-friendly experience. 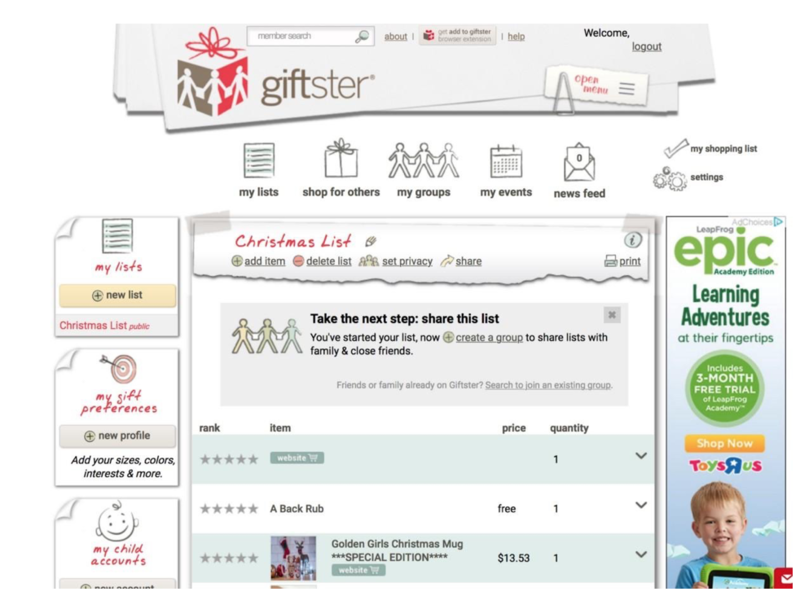 Mobile and desktop applications and cross-device sync allows every family member to access Giftster from their preferred platform. Including the option to build a wish list for a child sets this site apart. The gift preferences option is another nice touch, allowing users to indicate personal tastes. 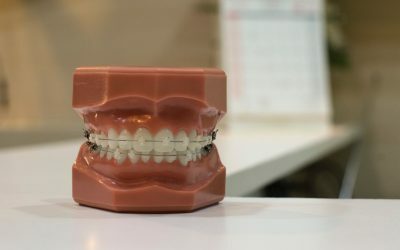 Too many options may not seem like a detractor, but in this case it can quickly make some features feel over-complicated. The inclusion of third-party advertising adds visual clutter. The simplicity of the design and layout keeps this site fresh and straightforward. For users who like to customize their experience, they’re able to change the visual theme of a wish list to suit their tastes. One major limitation compared to other site is only being able to build one wish list. Including an image during item fetch works only when adding via the Wishlistr bookmarklet. 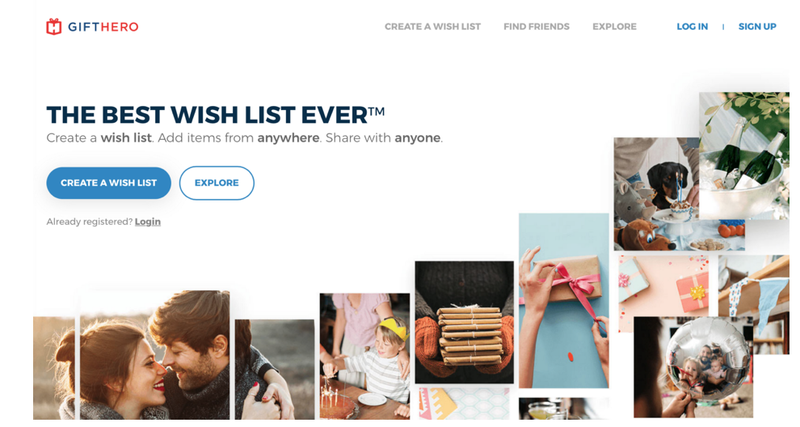 Functionally, Checked Twice is very similar to the other wish list sites, pitching themselves as “the gift registry for families.” However, the limited scope of features means that best users are those involved with a gift-giving group. Checked Twice makes up for the lack of live Customer Support with a very effective sign-up tutorial. After joining, the site walks users through account set up and the interface. 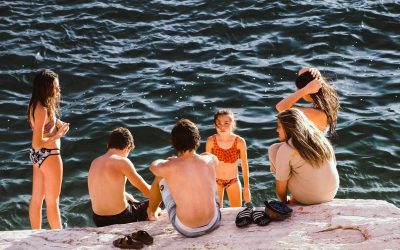 Because of its focus on groups, the site doesn’t hold many benefits for individual users. Before it can be useful, users will need to create or join a group — even to simply share a wish list. As they find their way into a wider variety of gift scenarios, registries and wish lists have expanded beyond life events and holiday seasons. 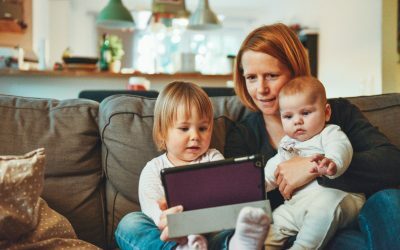 Families and friends looking to streamline and perfect all of their gift-giving experiences will feel comfortable with any of these platforms. Choose the service that best supports your scenario, build out your own list, and encourage your loved ones to follow suit. You’ll soon forget the headaches and frustrations common in the gift giving of years past. Angela Stringfellow is the managing editor at Family Living Today, a free resource for expert safety information for your whole family. She writes about home security, child safety, shopping for the whole family, and family caregivers.